Washington’s vocational and trade schools focus on training graduates to work in the state’s thriving technical and service industries. Fast-growing fields in Washington provide opportunities for skilled workers such as carpenters, maintenance and repair technicians, commercial truck drivers, nurses and nursing assistants, and office workers. Each year, Washington’s network of community and technical college prepares about 386,000 students to enter the workforce or transfer to a four-year university. 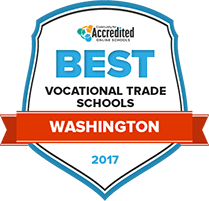 The following guide offers an overview of vocational and trade school education in Washington, along with information on the employment outlook. Washington's trade and vocational school options are widespread and varied. For example, jobs in the construction and repair industry are growing rapidly, which is why so many vocational programs found at many trade schools and community or career colleges focus on those areas. Students curious about attending Washington trade schools can look at our rankings for guidance, as they take into account many factors including tuition, financial aid, student-teacher ratios and length of programs. Specializing in two-year programs, Spokane Community College offers numerous fields of study for both vocational certification and advancement to four-year schools. SCC also participates in The Western Undergraduate Exchange, allowing students from a select 15 west coast states to attend SCC with discounted tuition. Apprenticeship programs are available to students looking to enrich their formal education with on-the-job experience. Student resources include on-campus computer labs, a free health clinic, Head Start and Early Head Start childhood education programs and tutoring services. Extracurricular clubs and activities, both athletic and non-athletic, are available to any student who wishes to participate in them. Bellingham Technical College in Washington State offers a range of degrees and programs to students looking to advance in a trade. It is the only technical school in northwest Washington. BTC prides itself on small class sizes and high-tech, hands-on programs in most of which students remain with their classmates throughout the course of study. Some of the programs they offer include accounting, nursing and engineering. Students may choose between a la carte courses, certification, or degrees for many of the programs. They also have simple application and enrollment procedures for first-time, transfer and co-enrollment students. Renton Tech offers 90 certification options and 53 associates degrees. Some of the unique degrees and certifications offered by the school include band instrument repair technology, property maintenance for multi-family residences, and culinary arts. With programs in automotive, business, culinary arts, early childhood careers, healthcare, technology, and trade industries, students have many options for career preparation. RTC aims to train students with practical industry skills at minimal cost. Whether students plan on pursuing or advancing their careers after trade certification, or moving on to a four-year university, they can find a program that prepares them for the future. At Clark College, students attend small, university-level classes to prepare for futures in their chosen fields. The school has associates programs in arts, science, applied science, and applied technology as well as vocational certification programs. Over 125 programs are offered in fields like business, computer science, humanities, health professions, fine and applied arts, engineering and math. There are also international Foreign Language Immersion Programs that allow students to study abroad and improve their language skills by living among locals. Clark has co-admission and conditional admission agreements with some four-year universities, allowing students to accomplish their academic goals faster and with less stress. Everett Community College prides itself on preparing students to transfer to four-year universities. The school’s core learning outcomes include taking responsibility as active learners, thinking critically, communicate effectively, participate in diverse environments, utilize information literacy skills, demonstrate computer and technology proficiency, and identify elements of a sustainable society. Students attending ECC can pursue vocational careers in aerospace and advanced manufacturing, arts and learning resources, business and applied technology, communications, social science, the health sciences, public safety, math, science, and transitional studies. In addition to two-year associate degree programs, ECC offers vocational and career certification programs that can typically be completed in one year. Secondary students in Washington who have completed CTE programs have a 91 percent graduation rate, compared with an overall state graduation rate of 79 percent. More than 350,000 high school and middle school students in Washington were enrolled in a CTE course in the 2013-2014 school year. 84 percent of vocational and trade students met proficient or advanced levels on the state reading/language arts assessment, significantly more than the state target of 77 percent. Surveys of employers of Washington vocational graduates showed a 95 percent satisfaction rate. In Washington, vocational students can pursue associate degrees and vocational certificates to either enter the workforce directly, or to get a head start on a bachelor’s degree. The number of students who choose programs that take less than a year are well above the national average, with trade schools and career colleges offering options in fields such as cosmetology, medical assisting, massage therapy, culinary arts, truck driving, audio production and multimedia design. Top Washington vocational careers that are expected to grow by more than 20 percent by 2022 include medical assistants, hairdressers, registered nurses, paralegals, dental hygienists and web developers. In most cases, annual wages in Washington for the top-growth careers exceed the national median annual wage for the same positions. The following table outlines the top five occupations with the most job openings for candidates with some college education and associate degrees in Washington. There are more than 100 trade schools in the greater Seattle area, with 30 schools located in the city proper. These include community colleges and tribal schools, as well as numerous specialized schools with programs in cosmetology and hairdressing, culinary arts, construction, metalworking, massage therapy, art and film, nautical and marine trades, truck driving, nursing, and aeronautical and technical training. Three campuses of the Seattle Colleges offer associate degree and career training programs; a fourth branch of this community college system is the Seattle Vocational Institute, which focuses on shorter programs designed to train students for entry directly into the workforce. SVI offers a wide range of certificate options, including popular majors in the fields of computer support, cosmetology, medical and dental assisting, phlebotomy, and pre-apprenticeship construction training. Seattle is home to industry leaders in digital e-commerce, software, aerospace, and medical research, opening up opportunities across all sectors of the economy. Major employers in the Seattle area include Boeing, Costco Wholesale, Microsoft, Amazon and Starbucks. CTE Washington helps high school students create career plans, offering information about apprenticeships, high-demand careers in the state, and skills-based classes. Government site with information on the workforce, job market, tax records and training information in various occupations. The state’s largest professional organization represents educators and staff employed in career and technical education. The organization sponsors an annual conference for members. The TSA serves high school students who have completed their technology education or pre-engineering courses and are eyeing careers in fields such as architecture, construction, engineering, graphic arts, manufacturing, or film/video production. Washington’s official state site for career resources provides a resume help/skills center, and the organization hosts state and regional job fairs. Search listings of official job postings for Washington State governmental agencies and organizations. Listings are sorted by career type, salary and location.